I’ll Find A True Love is one of those deep soul records which has a very high underground reputation – and deservedly so. 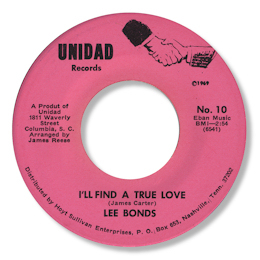 Bonds cut this in Columbia, South Carolina and it never really got out of the state, despite distribution by Hoyt Sullivan in Nashville. But it really should have done, not just because of his carefully intense vocal but also the excellent horn pattern (especially the meandering tenor sax) and lovely bluesy chord changes. One to treasure.